This week, the NY State Public Service Commission (NYPSC) is holding a technical conference with the purpose of discussing their 2015 report "Staff Assessment of Telecommunications Services", and to address the mostly ignored Connect NY Coalition Petition, which was filed in July 2014 and called for a series of investigations. Click to see New Networks Institute's new reports from "Fixing Telecom" and our previous reports, which were used in the Connect NY Coalition Petition. This Summary Report is designed to give a quick sketch of some of the issues with the New York State report and exposing the current financial shell game. The State report manipulated the costs of services to customers -- The State doesn't use actual communications bills; they used the promotional price only. The information is off by 30%-120%. 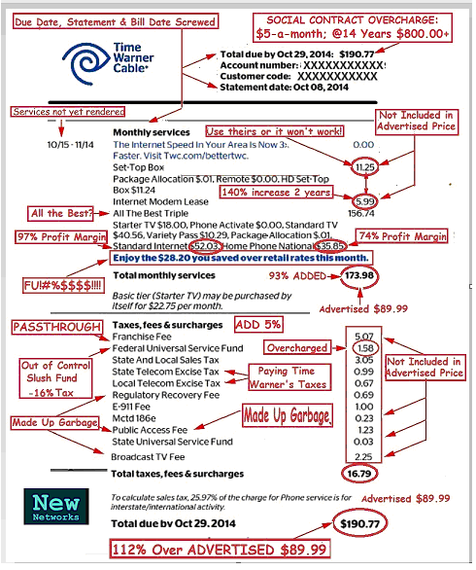 Customers were overcharged based on "massive deployment of fiber optics" and manipulated losses. Starting in 2006, Verizon got at least three rate increases, over 84%, and customers were overcharged $1000.00-$1500.00 per line extra for the 'fiber optics' and 'losses'-- and counting. $200 Million or $8.4 billion? Verizon manipulated the utility construction budgets. -- Verizon claims to have spent $200 million for copper maintenance in all states since 2008. Yet, Local Service, in just New York, was charged $8.4 billion in network expenses, from 2009-2014. Where did all the money go? It cross-subsidized wireless and FiOS, a cable service. The NY AG claims that 75% of the 2011 construction budget of $1 billion was diverted; our research shows it mostly went to build the fiber optic wires to the cell sites, starting in 2010. The FCC's "Big Freeze" created cross-subsidies. The FCC set how their accounting rules are applied to phone company expenses, based on the year 2000; the consequence was it dumped most expenses into Local Service. The State and Verizon manipulated the accounting of access lines. 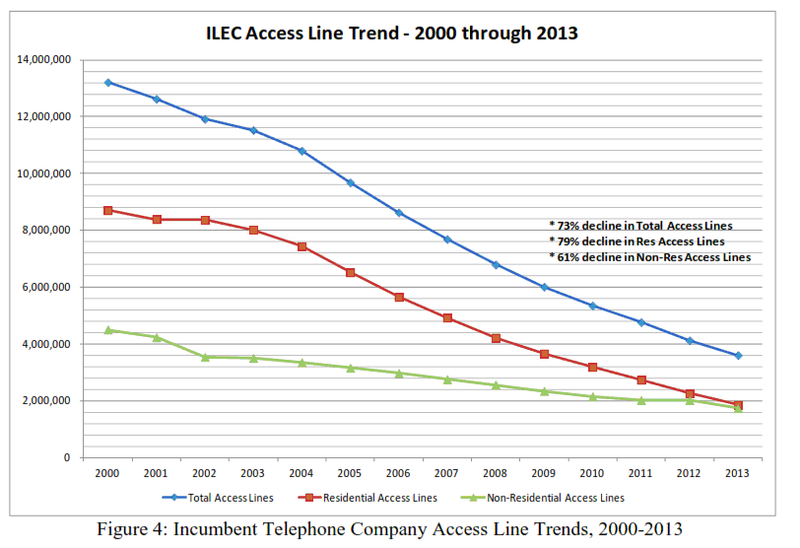 --There are an estimated 65 million access lines in NY, not 2.7 million. The State and Verizon only count basic voice lines, which is a subset of total lines -- the majority of copper lines are 'special access' lines and not counted. Verizon New York's FiOS deployment only passes 45%-62%. -- When comparing Verizon's statements with actual Census and FCC data, Verizon's coverage is around 50% and a lot less counting all the 'gaps'. Verizon NY lost $13.6 billion in since 2009. -- Verizon NY has lost over $2 billion annually since 2009 (with a caveat for 2013) and hasn't paid State or federal income taxes since 2003, it appears. The losses are NOT from the costs of offering local phone service. NOTE: When we asked to present this information at the state event, we received the following reply: "We are not at this time going to expand the panels. Time permitting; there may be an opportunity for audience participation near the conclusion of each panel." I will address the issues brought up in the meeting agenda in a separate response. 1)	The State Report Manipulated the Costs of Services to Customers. 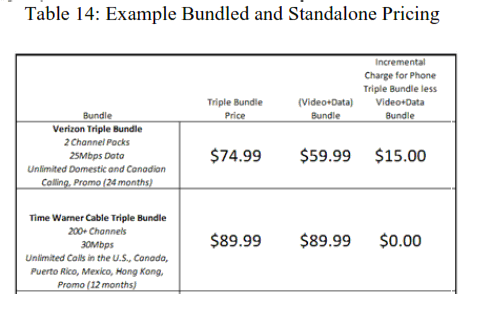 This chart is from NY State's Assessment of Telecom report and details the pricing of the Double and Triple Play by Verizon and Time Warner Cable. The State doesn't use actual phone or communications bills. Instead, they only used the promotional pricing of Verizon and Time Warner Cable, without the made up fees, etc. FINDING: The State's pricing information is off by 30%-120%+. And this is the author's Time Warner Cable Triple Play after the 12 month promotion ended, having gone up over 112% for this $89.99 package. The current bill is for $203.07 -- 126% above the advertised price. No one can ever get the advertised price, ever, as even the promotional price is missing 30%-50% of all charges a customer must pay. Moreover, there is no direct competition to primary services so every part of the bill has had increases -- almost continuously. 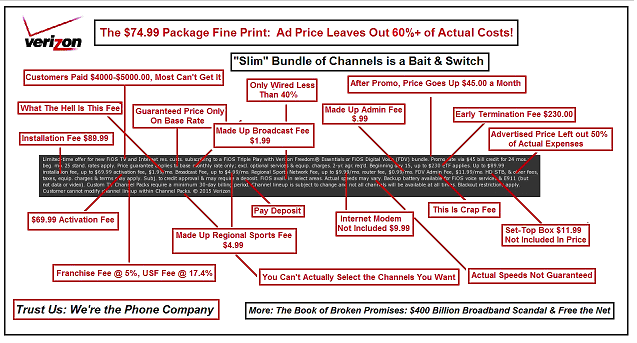 Verizon is no better and uses the same deceptive advertising, marketing and billing practices. Quoting just the promotional price vs doing actual communication bill surveys shows a serious lack of how to analyze basic data, but also it covers over the actual costs to customers to make it look like things are 'cheaper' and that there is competition -- when it doesn't exist. 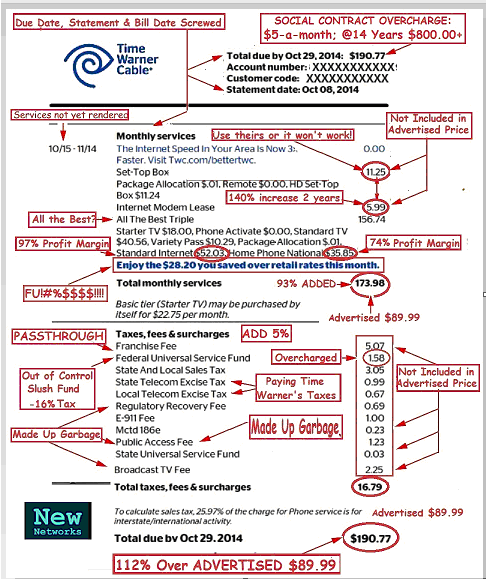 2)	Customers were Overcharged based on "Massive Deployment of Fiber Optics" and Manipulated "Losses". In New York State, local phone customers have had at least three major, separate rate increases starting in 2006 for 'massive deployment of fiber optics' and 'losses', i.e., 100% of local phone customers paid for 'greenfield' upgrades of the state utility but only 50%-60%, or so, ever got upgraded -- or will get upgraded. "We are always concerned about the impacts on ratepayers of any rate increase, especially in times of economic stress,' said Commission Chairman Garry Brown. 'Nevertheless, there are certain increases in Verizon's costs that have to be recognized. This is especially important given the magnitude of the company's capital investment program, including its massive deployment of fiber optics in New York. We encourage Verizon to make appropriate investments in New York, and these minor rate increases will allow those investments to continue." "The rate increases will generate much needed additional short-term revenues as the company faces the dual financial pressures created by competitive access line losses and the significant capital it is committing to its New York network....For 2008, Verizon reported an overall intrastate return of negative 6.7 percent and a return on common equity of negative 48.66 percent." Unfortunately, as we show, the construction budgets were diverted to other lines of business, which also helped to create massive losses. 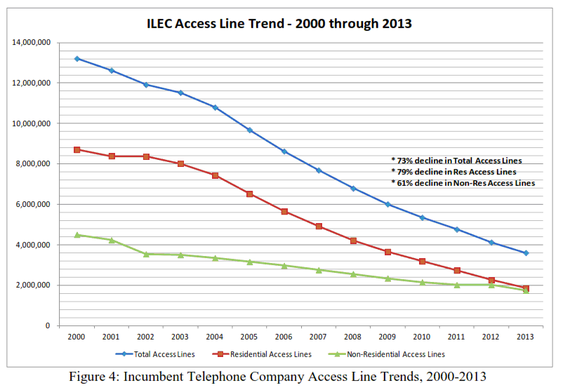 And the 'access line' accounting leaves out the majority of actual, copper-based lines in service. 3)	Manipulation of the Utility Construction Budgets -- "$200 Million" or $8.4 Billion? Verizon claims to have spent $200 million for copper maintenance, but Verizon New York's Local Service was charged $8.4 billion in network expenses, from 2009-2014. "Verizon since 2008 has spent more than $200 million on its copper network." And, $200 million is for all of the Verizon states. Later, this statement was picked up by the Communications Workers of America, (CWA) and the cities who aren't being properly upgraded and they challenged Verizon. "We ask that you address a particular matter that has come to our attention this month. In an ex parte letter filed by Verizon for the Federal Communications Commission's (FCC) recent proceeding regarding the retirement of copper facilities, Verizon attempts to rebut labor and consumer group evidence that Verizon is de facto abandoning its traditional landline copper telephone network through lack of proper maintenance and repair. In its defense, Verizon wrote: '[S]ince 2008, Verizon has spent more than $200 million on its copper network.' This shockingly small level of investment in the copper network confirms what we hear regularly from businesses and consumers: Verizon's traditional landline service is unreliable, repairs are never permanent, deteriorated cable is not replaced, and new installations are delayed...Verizon's statement to the FCC amounts to an admission, on the record in a formal regulatory proceeding, that it has spent virtually nothing over the past seven years on its traditional copper network...Verizon has been systematically misleading the Commission about its commitment to ensuring high quality service to customers who remain on the traditional landline network." Verizon's mea culpa, as stated in their letter to the FCC on September 18th, 2015, claims that this was an incomplete picture of all expenses for the copper wire maintenance, etc. But this is only a small part of a massive financial shell game and one has only to compare this statement with actual data. 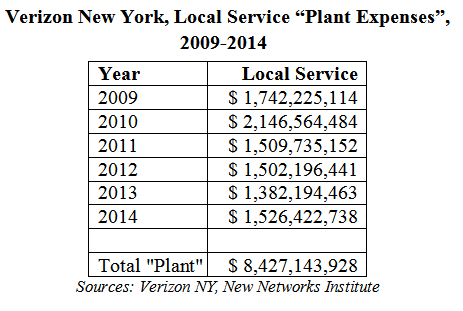 This next exhibit, taken from Verizon New York annual reports, shows that Verizon NY's Local Service paid $8.4 billion in "Plant" and "Non-Specific Plant" expenses from 2009-2014. If Verizon New York is adding $1.4-$2.1 billion in network costs annually to the Local Service category, where is all of this money going? Verizon stopped upgrading the networks around 2010-2012, and it slowed down maintaining the state copper-based utility networks over the last decade. And even if Verizon spent $200 million in just New York, and in just one year, it would still be a fraction of the network costs that have been allocated against the copper-based local phone service revenues. 4)	Where Did All the Money Go? Cross-Subsidized Wireless and FiOS, a Cable Service. In 2011, the NY State Attorney General's Office detailed that 75% of the capital expenditures in New York State went to fund the building of the fiber optic wires to cell sites and to FiOS, not to the maintain the state's copper networks. "Verizon New York's claim of making over a 'billion dollars' in 2011 capital investments to its landline network is misleading. In fact, roughly three-quarters of the money was invested in providing transport facilities to serve wireless cell sites and its FiOS. Wireless carriers, including Verizon's affiliate Verizon offering wireless, directly compete with landline telephone service and the company's FiOS is primarily a video and Internet broadband offering....Therefore, only a fraction of the company's capital program is dedicated to supporting and upgrading its landline telephone service." In short, the money to maintain and upgrade the networks as part of the state utility was diverted to fund other lines of business, even though customers were charged for "massive deployment of fiber optics" and 'losses'. 5) The FCC's "Big Freeze" Created Cross-Subsidies. In 2001, the FCC created a set of accounting rules that 'froze' the expenses charged to each line of business to be based on the year 2000, and thus made all proceeding years be based on the percentages from the year 2000. 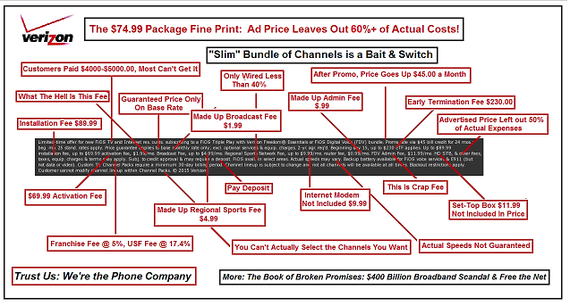 The FCC's "Big Freeze", then, has distorted all accounting and financials for the last 15 years and no government agency, not the FCC or the State, can calculate the actual charges to end users or competitors and can't, then, calculate whether the prices are 'fair and reasonable'. And since this is a federal issue, this problem is not specific to Verizon New York but is being played out in every state and every phone company throughout America. Thus, every year the same shape model has been applied to the expenses. And it is shocking to see when every year is lined up. This next exhibit is of the FCC's Big Freeze impact of applying 'Corporate Operations' expenses in Verizon New York to Local Service. While 'Local Service' revenues declined, the expenses remained virtually identical year after year. In fact, the revenue losses of the local networks can be attributed to the other lines of business not paying common costs, which created the impression the local networks were 'unprofitable', which led to massive rate increases, which helped to 'migrate' the customers to wireless through the 'harvesting' of local, utility phone customers. This is what the State is reporting about access lines. "Once monopoly providers of landline telecommunications services providing retail voice and data services to about 13 million subscribers in 2000, the incumbent local exchange carrier industry has lost over 73% of its access lines, with an overall industry negative rate of return." What a shame it is all just made up. We do not argue that as the price of service continued to rise, customers dropped the lines that were used for voice phone calling. But something is amiss. 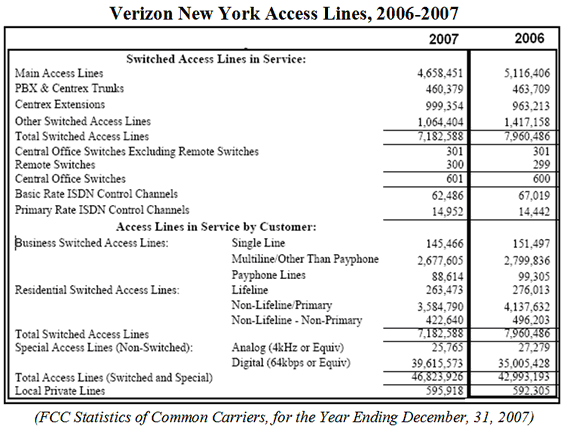 This is the last FCC published information, supplied by Verizon New York, about the Total Access Lines, in 2007. It shows that there were 47 million total lines in 2007. According to Verizon, there were only 2.7 million access lines; about 4% of total lines in 2014. Special Access line accounting is not included in the access line accounting supplied by Verizon, or any telephone company. Moreover, the FCC's recent data showed that mostly copper-based special access services represented 60% of this $40 billion market in revenue -- i.e., in America, in 2013, there was $24 billion in revenues for copper-based (TDM), telecommunications-based, special access services. But the kicker: There is no documentation of the number of actual copper-based lines in service -- "0" lines -- How can that be? And in Verizon New York's financial accounting we find that special access has grown over 38% in revenues from 2009-2014, and had reached $1.8 billion in revenue in 2014, while Local Service was only $1.4 billion. But again, "0" copper or even fiber optic special access lines are accounted for. All of this is exasperated by this 'deceptive' framework. If the State or FCC are 'deregulating' a line, it is NOT only for a voice call, but all other services are impacted -- fax, competitive DSL, alarm circuits, etc. -- as they rely on wires that are part of the state utility. The CDC numbers are useless. The Center for Disease Control (CDC) data is often quoted but it does not represent 'wireless-only households' as it doesn't count the wires; it counts voice calling only. The alarm circuits (26% of households), the wires used for cable service, the wires for the home office aren't counted; neither are the small business ATM machines, credit card readers and a host of wires that go to the WiFi hot spots. They are the same copper wires and the FCC and State have neglected any accounting. In fact, the AT&T-paid-for survey report that is quoted by the State Commission shows that 84% of households in New York State have a wired broadband connection at home and 26% of homes have an alarm circuit. The State has no clue about the actual number of copper wires in service today and it is making public policy decisions that are NOT data-driven. Period. 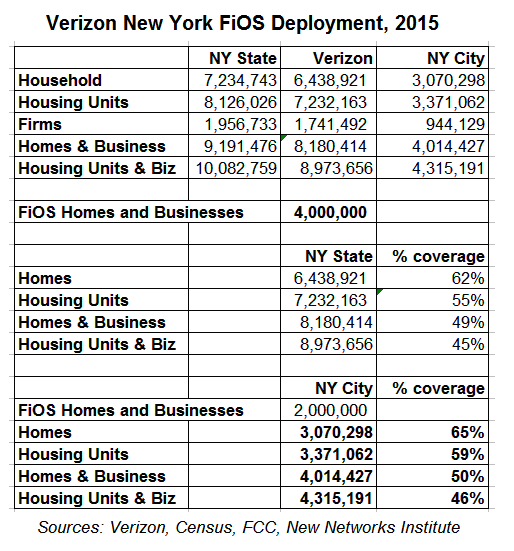 8)	Verizon New York's FiOS Deployment Only Passed 45%-62%. How many fiber optic lines were installed? Only 45% to 62% of "Housing Units and Businesses" have been 'passed'-- that's it. Verizon's own press release claimed that it had "over 4 million homes and businesses" in New York State, at the end of 2014, which includes New York City. "Fiber-optic networks strengthen communities, and last year Verizon continued deployment of its 100 percent fiber-optic network, with its FiOS TV and FiOS Internet services. At year's end, FiOS services were available to more than 4 million New York and Connecticut homes and businesses. Verizon has placed more than 161 million feet of fiber optic cables in the two states." NOTE: We used Census data about the "housing units", "households", and "businesses" in New York State and New York City, as these terms vary the outcomes. And we use the FCC data pertaining to market size of Verizon in New York State. NOTE: The quote from Verizon is for 'homes and businesses', while the New York City franchise appears to use 'households' in some places, but in other places uses 'residential dwelling units'. They are not the same. There are 300,000 more 'housing units' than 'households' according to the US Census, (and almost 800,000 more in New York State total). a)	If Verizon covers 4 million homes and businesses. d)	Then, Verizon can only have 2 million covered in New York City. e)	Census tells us that New York City has 3 million homes. g)	The Verizon New York quote states that there are 4 million "homes and businesses", then availability in New York City is only 50%. h)	And if we use "housing units" and "housing units and businesses", the number drops further. Verizon NY lost $2.6 billion in 2014 and had an "income tax benefit" of $1.3 billion. Starting in 2009, Verizon NY showed losses with an average of $2.3 billion a year and a resulting 'income tax benefit' of $1.1 billion. For this six year period, Verizon NY lost $13.63 billion and had an income tax benefit of $6.34 billion. NOTE: 2013 showed a profit from a one time 'extraordinary' pension income deal.